By the mid-1700s Turnpike Trusts were being set up around the country to look after the highways in their immediate area. Initially the network of roads was limited, with many by-roads often being impassable or mere animal tracks and it was the case that toll houses were often few and far between apart from on the peripheries of the larger towns. The Exeter Turnpike Trust was one of the earliest in Devon, established in 1753 and was responsible for 141 miles of road. This city-centred trust was created to manage a very large network of roads radiating from Exeter. It grew to eventually manage one of the largest mileage of turnpike roads in the country, though many of these were minor routes that may have remained parish roads elsewhere. Its responsibilities were (a) the two London post roads that converged on Exeter from both east and west (b) roads running to connect with the turnpike trusts of North Devon and (c) a number of short roads reaching out to smaller communities in East and Mid Devon. Between 1820 and 1831 it commissioned the building of new roads to the East, North and West, collaborating with adjoining trusts to create new through roads to the important towns in Devon. The main turnpike road from Exeter to Plymouth originally passed through Chudleigh via Alphington, Shillingford St George and Clapham. This road was one of the first of thirteen roads mentioned in the House of Commons report dated 9 February 1753, the Exeter Trust being responsible for the ten-mile section 'from the house called the Plymouth Inn in Parish of St Thomas to Chudleigh Bridge', a distance of ten miles. Where the original turnpike road passed from Kenn parish into Chudleigh there is a name White Gate. This referred to a stop-gate across the turnpike road at which tolls would have been collected as travellers passed from one parish to the other. There is no evidence at this location today to show exactly where the toll house or its gate stood. Following de-commission the house would have been sold off to the local landowner and although mentioned as occupied on both the 1851 and 1861 census it was probably demolished not long after the latter year. This road, from Alphington to Chudleigh, was dis-turnpiked following the opening of a new turnpike road in 1822 of five miles in length that was routed from just beyond Kennford on the Exeter–Newton turnpike to Chudleigh, via Haldon, past Filleigh and into Culver Street. Resulting from the setting up of the Turnpike Trusts, at least two toll houses with their associated stop-gates were constructed in Chudleigh parish, at the top of Haldon Hill (close to the Haldon Diner site today) and at Beggars Bush (on the old A380). Two other stop-gates have also been identified in the parish that possibly also had an adjacent toll cottage, at the Kenn/Chudleigh boundary on the old Exeter road and 150m on from Thorns Cross (Exeter direction on A380). The early houses, originally of rudimentary design would have been demolished and rebuilt in the Napoleonic era as road travel increased and likely then to have been two-storey with a three-sided elevation to the road. The front door and porch would usually have been in the centre with windows in the angled sides to enable the collector to see either way along the road from inside the house. The Acts governing Turnpike Trusts invariably included a clause permitting the taking of a garden plot and this was in most cases done unless a lack of space prevented this. In Chudleigh we can assume that the known toll houses had gardens due to their rural locations. Building of toll houses continued through the 1820s, 30s and 40s and had ended by 1845, as no new roads were constructed after that date. The railways played a large part in the ultimate demise of the turnpikes and most houses were out of use by the early 1880s and sold off – this was certainly the case in Chudleigh. The Highway Boards then took over the maintenance of the roads and often the houses were pulled down. The Chudleigh District Toll House (and referred to in the census returns as Stop-Gate) was built in 1822 to serve the new turnpike road that was constructed to link the Exeter to Newton road at Kennford with Chudleigh. Its location was about where the Kenn-Chudleigh boundary stone is located today, i.e. alongside the A38 dual carriageway almost at the summit of Haldon Hill near the Haldon Diner. This building was out of use in the early 1880s and on 10 November 1881 sold to John Henry Francis Ley Esq of Kenn for the sum of £80 and demolished sometime afterward. No evidence of it remains today. This highway was referred to as The Great Western Road in the 1871 census. 1901 There seems to be no evidence of the toll house on this census which leads to the assumption that the building was demolished sometime following 1891. The Beggars Bush toll house and gate, erected by 1838 was located on the main Newton Bushell to Exeter road, not far from Higher Dunscombe Farm at the junction of the by-road to Chudleigh via Biddlecombe Cross that was turnpiked 1831. That road passing into Chudleigh down Tower Hill, over Kately Bridge and up Mill Lane (later Clifford Street) to Conduit Square at the obelisk. The toll house seems to have survived no more than sixty years and was advertised to let in the 8 October 1840 edition of the Exeter Flying Post. The building was sold in the early 1880s to Lord Clifford of nearby Ugbrooke. It is mentioned as an empty dwelling on the 1891 census and was probably demolished not long afterward. No evidence of it remains today. 1891 The Toll House is again listed in the census but as unoccupied. It was probably demolished sometime in the next ten years. John Hayward of Dawlish carriage driver to appear before the justices charged with assaulting Sarah Gilley, widow, toll collector at Beggars Bush Turnpike Gate. Eli Gilley, labourer statement that John Hayward of Dawlish, carriage driver, did assault Sarah Gilley, toll collector at the Beggars Bush Toll Gate on the Exeter Turnpike Road. About a mile towards Exeter from Beggars Bush was Thorns Cross close to which was a stop-gate referred to as Thorns Bar. This is thought to have been in use by 1861 until about 1889. Samuel Lendon was here in 1861 (Haldon House Stop Gate) and again in 1871 with his wife Elizabeth. By 1881 the census simply shows 'Thorns' as uninhabited. The 1901 census refers to 'Old Toll-Bar' which is likely the Thorns location, falling as it did in the census between entries for Harcombe and Sticks End. On the original turnpike road from Exeter via Shillingford St George to Chudleigh was a toll bar at what was called White Gate. Located on the boundary line of Kenn and Chudleigh it would have been put out of use at the dis-turnpikement of the road in 1822. The toll house/cottage was probably sold off then but remained as a habitation until at least the 1860s. In addition to the maintenance of the highways and the building of toll houses the Turnpike Trust were also responsible for erecting distance markers, known as milestones. The placing of such markers was made compulsory in 1766. From early times there have been two primary routes through the parish. In time these evolved into the trunk routes we have today. The A38 Exeter to Plymouth is one, the other being the A380 Exeter to Newton Abbot. 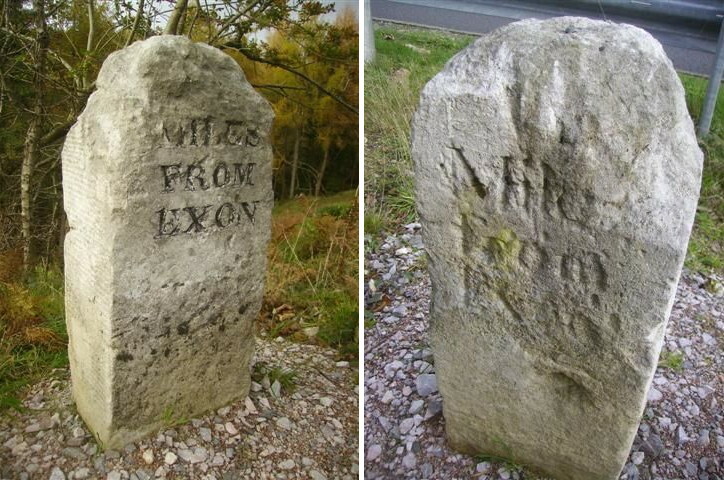 In both cases the milestones along these routes 'counted down' the miles toward Exeter and on some stones, mileages were given for both Chudleigh and Exeter. The former principal way from Exeter to Chudleigh and beyond followed a very early route that was opened as a Turnpike in 1753 and downgraded by 1822. From the end of Cowick Street in St Thomas, Exeter it passed along Cowick Lane to Alphington. From there to Shillingford Abbot, Shillingford St George and Clapham. It then traversed Haldon at Bullers Hill then descending toward Chudleigh, over Heathfieldlake Bridge and into what is now Old Exeter Street – a distance of nine miles. One further mile and Chudleigh Bridge over the River Teign was reached. At this point the Exeter Turnpike Trust had no further responsibility, the Ashburton Trust being responsible for the eight miles to that town. The next stone would have been at Whiteway/Oxencombe (7 Miles) and White Gate (toll gate) (6 Miles). Continuing on to Exeter after entering Kenn parish the next mile was passed just prior to Underdown Cross. 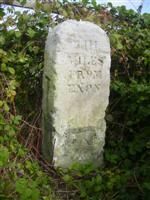 At Clapham (on the south verge of what once was the main carriage drive to Haldon House) is a surviving stone (4 Miles), At Shillingford St. George a stone (3 Miles), a stone at Shillingford Abbot (2 Miles) and at Church Road, Alphington the final stone on the route (1 Mile). The new turnpike road that replaced the one described above left Chudleigh further east via Culver Street, past Filleigh to Harcombe Cross and up over the Haldon summit and down toward Kennford. Just before reaching that village the route joined the already existing turnpike road from Newton Abbot that had descended Telegraph Hill. In Chudleigh, at the top of Station Hill can be seen the first still-existing milestone for the new route. The next stone (9 Miles) was erected in what then became called Exeter Road at which point, some fifteen years later was erected a country villa named Oakfield. This stone was illegally removed in 2004 and its current whereabouts is not known. The 8 mile marker stone (still exisiting) stands a little to the north of the Harcombe Cross Garage as shown below. A surveyors benchmark (c1887) can also be made out. The next stone (7 Miles) almost at the Haldon summit still exists albeit moved in July 2008 from the southbound carriageway verge – by Mouchel Enterprises – to the Exeter-bound carriageway verge. It has sustained some damage to its top, as can be seen in the following two images taken in 2010. The full inscription would have read 'VII Miles from Exon'. This is the last stone in the parish but continuing toward Exeter – passing the toll house once located on the Chudleigh/Kenn boundary line (at approximately the site of the Haldon Diner) – the next stone (6 Miles) would have been encountered on the west verge just below the Haldon summit at the start of the long descent toward Kennford. A melancholy event occurred near this stone in 1833 when it was the location of the last duel in Devon. Leaving that stone behind, what follows is the steep descent to Kennford. After passing the Kenn parish toll house – part-way down the hill – the five mile stone (and the halfway point between Chudleigh and Exeter) stood – until May 2011 – on the east verge at the entrance to the old filling station (Haldon Thatch) just before the Chudleigh and Newton Abbot roads meet at the base of the hill. Following representations by the Devon Milestone Society to Devon County Council this stone was located to a much safer spot a little further down the hill in the latter half of May 2011. This stone has a surveyors benchmark inscribed on it at the top and the inscription 'V Miles From Exon'. The stone carries marks of damage which is believed to have occurred during the excavation from its former site. On approaching Kennford the next stone (4 Miles) stood originally on the west verge opposite the Zion Chapel. 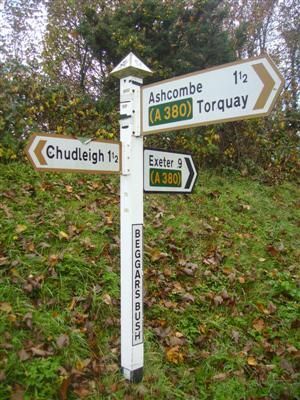 Today it stands a little closer to the village on the east side of the road and in addition to the Exeter and Chudleigh mileages it also gives '180 Miles to London'. This is a substantial stone of the 'facet' type. Leaving Kennford the next stone (3 Miles) stood on the west verge just before what is today Peamore Garage. The road continued toward Alphington passing over the Way Brook at which, now close to the bridge east parapet is the two mile stone, also of 'facet' type. 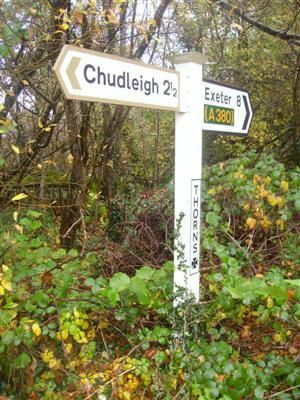 The final part of the route into Alphington passed along the then newly named Chudleigh Road, joining the original route just before the church and along Church Road to the existing stone – again of 'facet' type, the one mile to Exeter marker. From the 10 mile stone in Station Hill Chudleigh, southward, the Exeter Turnpike Trust responsibility as far as the Plymouth destination was concerned ended at Chudleigh Bridge. 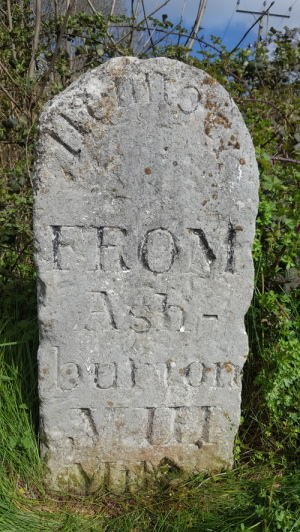 On the far bank of the river is a Hennock boundary stone that also doubles as the marker stating the end of the Ashburton Turnpike Trust responsibility. This stone is eight miles distant from Ashburton and it is worth noting that seven of the eight stones between this spot and the town of Ashburton still survive in their original (or almost original) locations. Exiting Chudleigh to the south and just before the approach to Chudleigh Bridge the road bore left, following a low-level route close to the river bank toward Bellamarsh Mill. This route, opened about 1822 by the Exeter Trust, replaced a much older route that climbed up over Shepherd's Hill toward Gappah before descending again toward Rixey Park and thence on to Kingsteignton. In time the new low-level road became the B3193 and in 1973 the section from Chudleigh Station to Bellamarsh Mill was lost beneath the south-bound A38 dual carriageway (though a section of the old tarmac has been re-discovered in the entrance lane to the rough field just before Bellamarsh Farm which was used to tip spoil from the A38 construction). Travelling toward Bellamarsh the 11 mile stone to Exeter – Newton Abbot 5 (no longer extant) was positioned on the left verge shortly beyond the Chudleigh/Kingsteignton boundary stone. Just beyond Rixey Park is the 12 mile stone to Exeter – on the south verge at Rixey Park Corner. 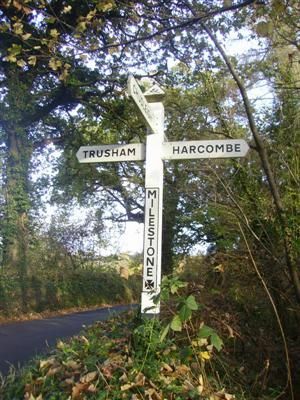 The next mile was passed near the hamlet of Preston. 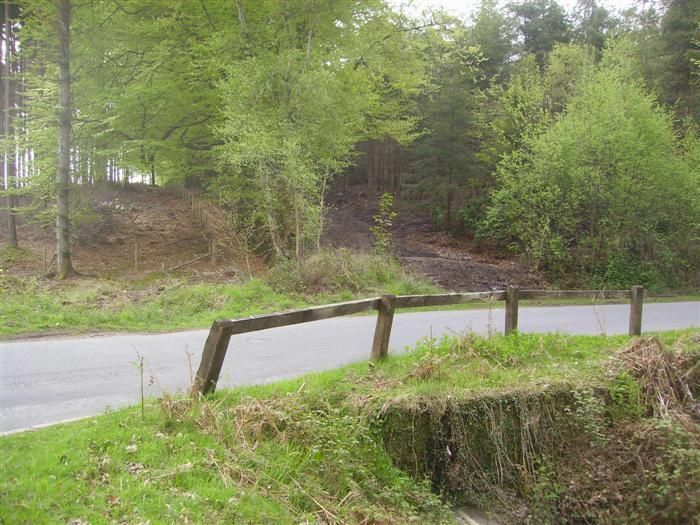 Major clay quarrying here has much altered the road layout and near what was once Preston Cross, stands – on the south side – a substantial stone marked Chudleigh 3 / Newton 3 / Totnes 11 / Exeter 13. From here the road (still today as the B3193) not long afterwards reaches the Old Toll House at New Cross. At this point is the junction with the turnpike from Exeter toward Newton Abbot and onward to Totnes. What is now the A380 dual carriageway that passes through the parish, in part follows an ancient line past Ugbrooke, up and over the Haldon Hills and down Telegraph Hill to Kenn. Some of this route has Roman origin, traces of which can be seen at Wapperwell, running parallel to what is now called Ideford Dip. Starting at the Kingsteignton/Chudleigh boundary our first milestone location (11 Miles) – no longer extant – was on the east side of what is now the lane from Ideford that joins the dual carriageway just before the commencement of Ideford Dip. The ten mile stone stood on the east side of the old road a little beyond Ideford Arch. Following road improvements in the early 1990s this stone was sold to a private individual and is believed to remain within the parish. The next stone (9 Miles) stood just beyond the sharp bend locally known as Fiddler's Elbow on the north verge. When this stretch of road was closed following major road improvements the stone was removed and resited on the replacement Exeter-bound carriageway (west verge) a little before the Ashcombe Cross junction. Returning to the old section of road just beyond the nine mile marker was the Beggar's Bush Toll House (see above). Steadily climbing up the Haldon escarpment the eight mile stone was located close to Thorn's Cross. The final stone (7 Miles) just inside the parish boundary with Kenn stood on the west verge close to an area of Haldon called Rushy Combe, neither this or the former eight mile stone exist today. The six mile stone (Kenn Parish) was just before the steep Telegraph Hill descent on the west side and thence to a five mile marker standing on the east verge almost opposite the five mile stone already mentioned as standing at the junction of the Chudleigh road (A38) and this road (A380). Travelling south on the A380 from Ideford Dip (the 11 mile stone to Exeter – no longer extant) the original road then continued to the outskirts of Kingsteignton passing the 12 mile stone – still existing on the north-bound lay-by – just about opposite to the B3195 junction that bears off to the left toward Kingsteignton. That original line of road (now as the B3195) continued until bearing right into what is called Strap Lane. Just before that turning – almost opposite the Ten Tors Inn is the still existing 13 mile stone. This short stretch of Strap Lane leads back to the line of the Roman road past Abbrook to the Old Toll House at New Cross. It is at this point that the road has its junction with the Exeter Turnpike road from Chudleigh (the B3193 until re-routed via Sandygate). Two further existing milestones are located in Chudleigh parish. These belonged to Teignmouth and Dawlish Turnpike Trust and are marked 6 Miles and 5 Miles to Teignmouth respectively. They both stand on Haldon. The first stands on the Newton Abbot-bound east verge of the A380 a little beyond Mamhead Cross and the second on the west verge of the B3192 just beyond its junction with the A380 at Ashcombe Cross. The Turnpike Trust records also show that a turnpike road was proposed in 1831 from Tedburn St Mary to Chudleigh Bridge (most of which is now the B3193). 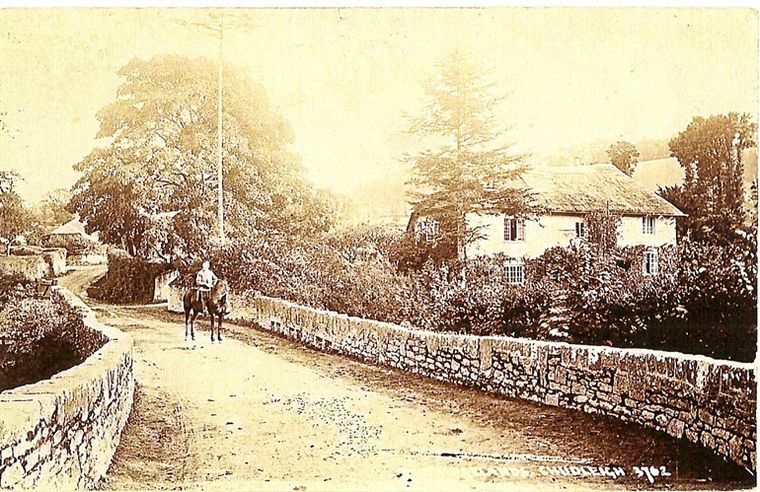 Although this road falls in Hennock parish at the Chudleigh Bridge end, a branch was to be taken off at Crockham Bridge, Trusham to 'the High Street in the town of Chudleigh' which would have been wholly in the parish. It is assumed that this branch was what is now the by-road to Farley Mill, thence past Northwood, up the bridleway past Chudleigh Woods and then the descent into Chudleigh via Wood Way (now called Woodway Street). Another early route, suggested to be of the mediaeval period (but likely of a much earlier date) linked Chudleigh with the then busy trading port of Topsham on the Exe estuary. Despite its antiquity the route can be easily traced today, and with careful navigation can be followed by walkers along its whole length. This route left Chudleigh in a north-easterly direction, initially to Harcombe (the Anglo-Saxon 'hare cumb') where it then followed the line of the Kate Brook upstream to an area of Haldon called Rushy Combe. Here the track passed out of Chudleigh parish and toward what is called Holloway Lane, a sunken track of chert and flint that forms the northern boundary of Kenton parish with that of Kenn. The lane continued in a long descent to Babel's Bridge, the crossing point of the River Kenn for this track. From here, after passing Willsworthy Cross – now in Exminster parish – the track passed up over the short and steep Kenn Lane and down Exminster Lane. Then skirting that village to the south the way turned eastward and out over the Exe marshes to a point directly opposite Topsham, a distance of about nine miles from Chudleigh. At this point a ferry operated across the river as it still does for walkers today. Today, travelling southbound close to where the A38 and A380 roads diverge (Splattford Split near Kennford), there is today a footpath that follows a much earlier route over these hills. It climbs in a south-westerly direction to bisect the minor road running across the top of the escarpment, at a point about half way betweeen the top of Haldon and Telegraph Hills. Unlike the other old ways across Haldon it climbed the hill at an angle, providing an easier climb. It was the original route from Kenn to Chudleigh and is sunken to a depth of two feet in its middle section. Originally crossing heathland, later occupied by the racecourse, it then descended through Oxencombe and then onward to Chudleigh. Chudleigh parish also has an ancient way passing through from the south to north-west. If we start at Teign Bridge near Teigngrace the route lay north-east to Gappah (Anglo Saxon meaning goat's path) then passing in to Chudleigh parish at Winstow. Thence to Castle Dyke (Iron Age encampment) and onward to Haldon passing Biddlecombe, Beggar's Bush, Thorns and Grammarcombe. At the summit of Telegraph Hill the route turned to the north-west skirting the northern side of what much later became the racecourse. On past Buller's Hill to Haldon Gate (close to Lawrence Tower, the site of another Iron Age encampment). The route then split, to the right downhill to Dunchideock – part of which still shows evidence of being a drove road and beyond to Exeter or to the left eventually reaching Holcombe Burnell. John Ogilby [Wikipedia] (November 1600 – 4 September 1676) was a Scottish translator and cartographer best known for publishing the first British road atlas. His Britannia road atlas published in 1675 comprised 100 plates. Chudleigh being on the route from London to Plymouth was included in plate 27 and that extract is shown below. The mileages shown are those from London and it is interesting to note that ninety-one years later milestones were placed in almost those exact locations. The map has some unusual spellings and omits information that would seem to us relevant. But it is easy to follow the route out from Alphington, through the two Shillingford's, to Clapham, up and over Haldon and into Chudleigh parish (where the hatched line shows). The '181' marker being the location of Milestone Cross. Chudleigh Bridge (Teign) [Parish Bridge] The current single-span bridge constructed after 1814 and by 1828 appears to have been a County Bridge. 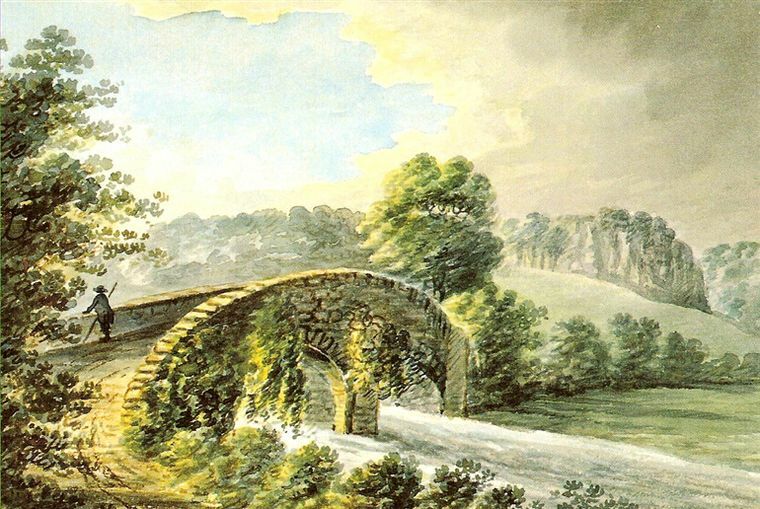 The Exeter Flying Post of 6 October 1814 requested proposals for the building of a replacement for the original stone two-arch bridge. The bridge was built to the specifications submitted by Rev. Mr Burrington of Chudleigh. 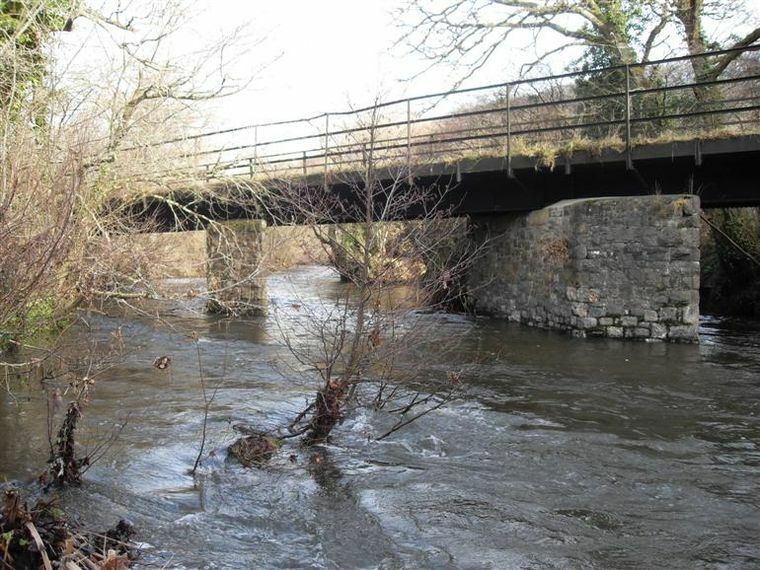 Chudleigh Bridge as photographed in December 2010, seen from the west side. Crocombe Bridge (Teign) [County Bridge] actually just within Trusham parish. Heightley Bridge (Kate Brook) [County Bridge] – Original stone bridge demolished c1971, replaced by one of concrete construction. One 'C' stone survives in the hedgebank at the base of Shepherds Hill. Lawell Pathfield Bridge (Kate Brook) [Parish Bridge] The take-off for the leat supplying Chudleigh Bridge Mill (long demolished and the leat mostly filled in) can be seen on the upsream side of the bridge. Kately Bridge (Kate Brook) [County Bridge] Also known as Bridgelands Bridge. 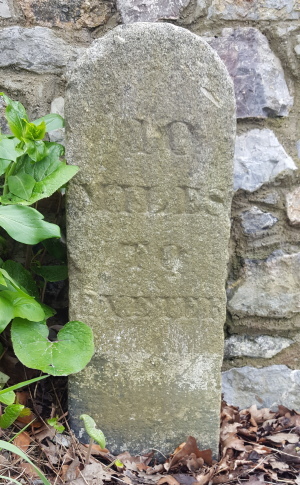 A datestone reads: THIS BRIDGE WAS REPEARED AT THE COVNTIES CHARGE 1681 and 1811 (The same stone also has a surveyors benchmark carved on it from c1887). This stone was discovered during roadworks in October 1987 and after the parish council involvement was replaced in a prominent position in the parapet wall (south side). 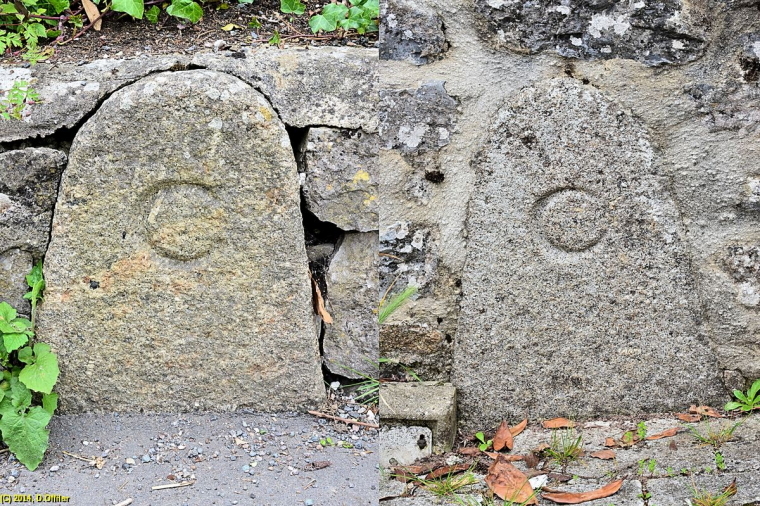 Both 'C' stones survive, at Mount Pleasant (east) and Glebelands entrance (west). 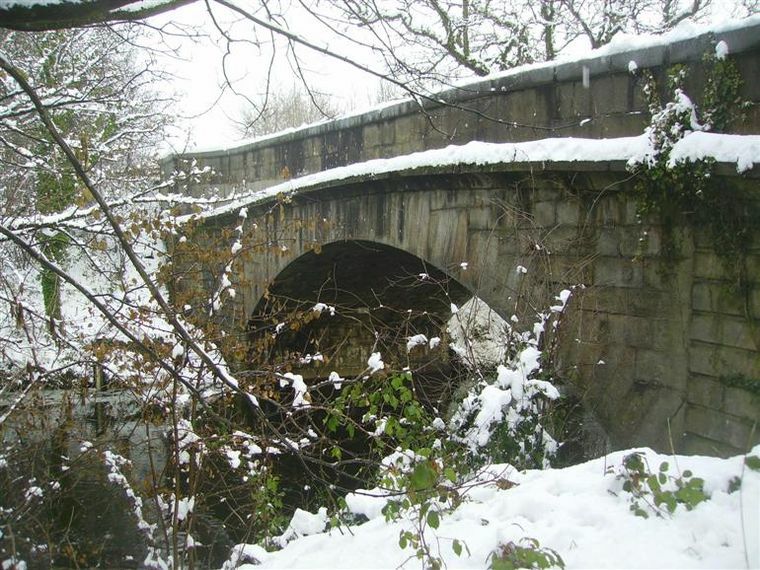 The parish was responsible for road maintenance, but for main bridges, the county looked after the bridge itself and 100 yards either side. The 'C' stones marked the transition of responsibilities. For more information on 'C' stones vistit the Legendary Dartmoor County Stones page. Kately Bridge 'C' (County) stones. Old Kate Bridge (Kate Brook) [County Bridge] (near cricket field). The road leading to this bridge from the Exeter Road is called Brocklands. Kerswell Bridge (Kate Brook) [Parish Bridge] The word Kerswell derives from the Saxon, meaning cress spring. Buddle (Bottle) Bridge (Heathfield Lakes/Buddle (Bottle Brook)) [Parish Bridge]. 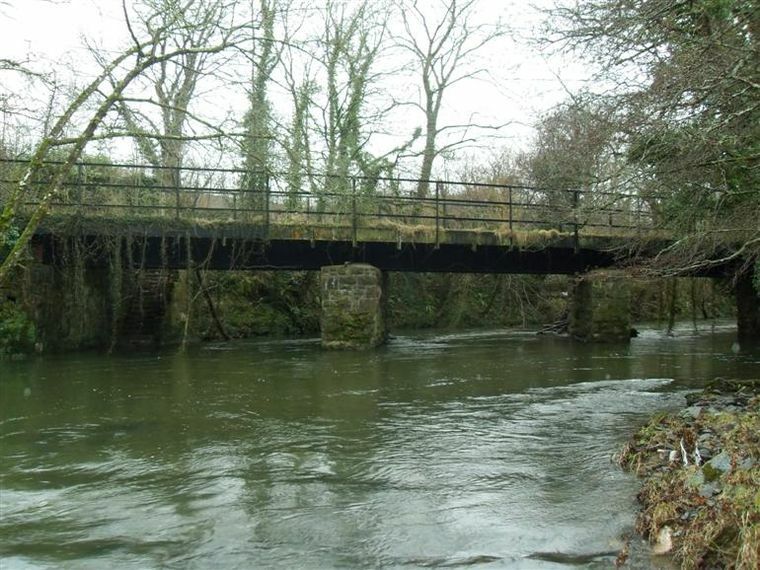 This bridge is mentioned as such in the parish records as early as the 1560s. What was the origin of this name? A buddle is an apparatus, especially an inclined trough or vat, in which stamped ore is concentrated by subjecting it to the action of running water so as to wash out the lighter and less valuable portions. Was there any mining in that area to necessitate the need for a buddle? The name was later corrupted to Bottle, ie Bottle Bridge, Bottle Brook. There is also a Buddle Lane in Exeter and a Buddle Spring and Buddle Lane in Hatherleigh. On the 'Exeter Memories' website it suggests a meaning of buddle as being a spring of water bursting through the road hence its name. This would equally apply at Hatherleigh as the spring still exists and was first recorded as such in 1658. This too could equally apply in Chudleigh and is more realistic than a mining instrument. Kate Brook is believed to be a corruption of Kidbrooke (Saxon), 'a place where the kite's fly'.